Chart #3 and #4 are good for a LOL (or a “WTF!”, depending on your sense of humour), and fortunately we’re not getting too many of these (if you don’t know what I’m talking about, take another look at the charts). A chart that looks similar to #1 or #2 is something we look at on a daily basis, though. Let’s look at the numbers behind chart #1 and #2. 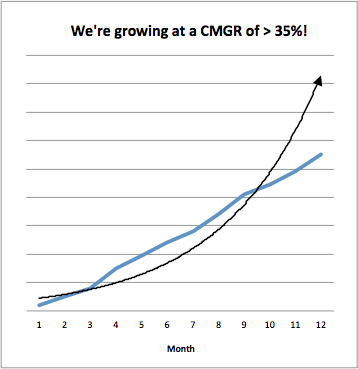 As you can see, chart #1 shows very strong signs of exponential growth: this (fictional) company’s MRR is growing at a relatively steady rate of 18-21% per month, and the amount of net new MRR which the company is adding is growing every month. 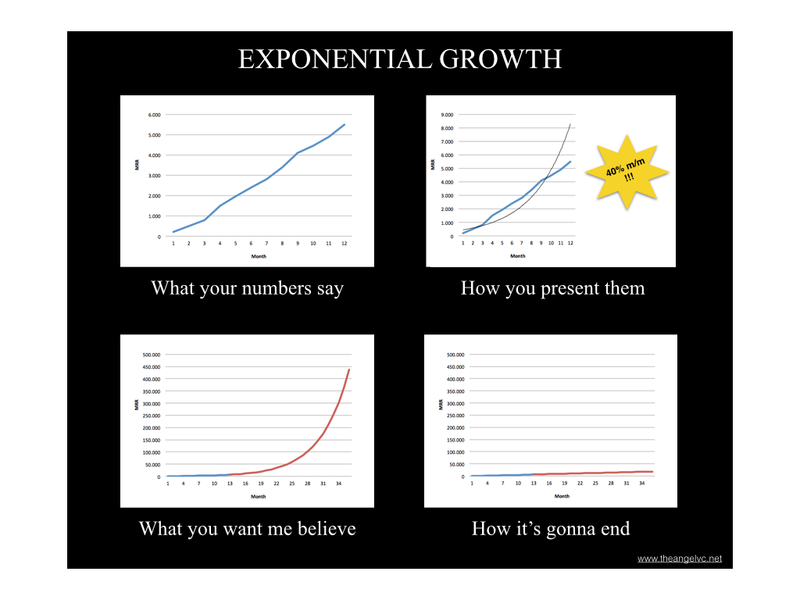 Mathematically this looks clearly exponential, and yet, since the absolute numbers are still so low, unless you understand the drivers behind the growth you don’t know if there’s real, sustainable exponential growth (e.g. due to product virality) or if it’s just a series of step changes which makes the numbers look like exponential growth. If this sounds like an academic question to you, think about its impact on the company’s growth projections. If there’s true exponential growth at a rate of around 20% per month, the company’s numbers will quickly go through the roof. If, on the other hand, the growth isn’t driven by inherently exponential drivers, you should expect the growth rate to decline quickly, leading to much lower projections. If you take a closer look at the numbers, you can see that in contrast to chart #1, in spite of the chart’s headline and trendline, it doesn’t look like something’s growing exponentially here. The monthly growth rate is higher than 10% in all but two months, but it’s fluctuating heavily and the amount of net new MRR is going up and down. 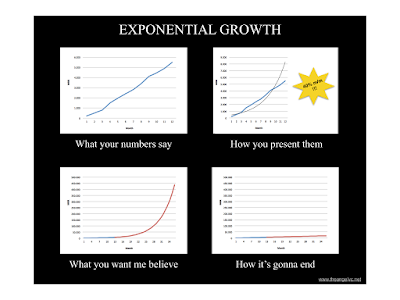 You can calculate a growth rate of 40% per month on average or a compound monthly growth rate (CMGR) of 35% without having to lie, and you can have Excel draw a trendline using an exponential regression. But I believe this is highly misleading. A more reasonable way of describing this company’s revenue growth would be to say that the company has been adding between $300 and $700 in net new MRR per month in the last ~ 12 months. Again, all of this may sound somewhat academic, but I think it has practical relevance in two ways: The first one is about how you communicate your numbers to potential investors when you’re fundraising. The second one is about how you’re projecting growth and what targets you’re setting for your team. Let’s take a closer look at both of them. 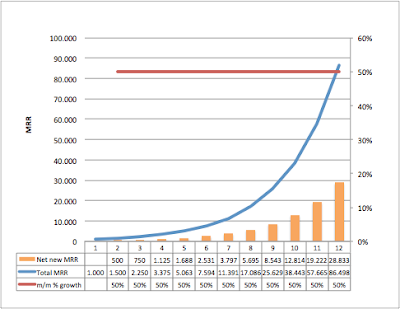 If your numbers look similar to chart #2 from above, don’t try to read exponential growth into the chart. If your numbers look more like chart #1, i.e. 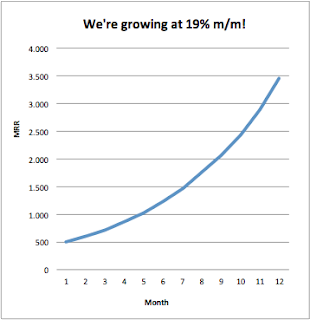 your monthly percentage growth is pretty stable and your monthly $ growth (or user growth, if you’re a consumer startup and pre-monetization) is going up consistently, it’s fair to talk about exponential growth. 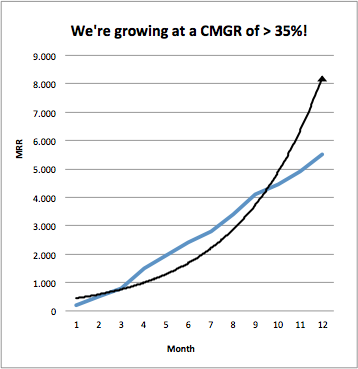 That said, as long as you’re at a very low absolute levels (say below ~ $20k in MRR if you’re a SaaS startup) it doesn’t make too much sense to talk about percentage growth rates, and talking about growth in terms of net new MRR per month may be more useful. 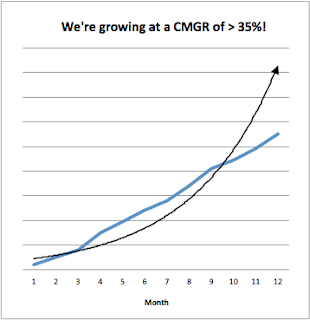 When you’ve reached what Jason M. Lemkin calls “Initial Traction” – around $1-2M in ARR – consider talking about y/y growth instead of m/m growth. There’s no strong rationale for that, but I think if you’re talking about longer periods of time, y/y growth is more intuitive to understand. 2) As far as your internal goal-setting goes, the problem with an exponential growth assumption is that for early-stage startups it makes short-term goals too easy and longer-term goals too hard (unless you’re one of the 0.0...1% of startups that have a viral growth engine with a viral coefficient greater than 1). 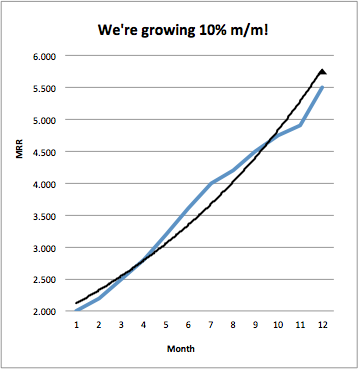 The blue line shows the total MRR at the end of the month; the orange bars show the net new MRR added in each month; and the red line shows your monthly growth rate in %. As you can see, you have to add pretty tiny amounts of net new MRR per month until around month 6 in order to reach your goals. Then it goes up quickly, and in the last two months of the year you’ll have to add $20-30k per month. The problem with a plan like this is that if you’re at $8000 after month 6 you think you’re on track, but actually you’ve only achieved 1/10th of what you have to achieve in the year. In this version you reach the same result after 12 months, but how you’re getting there is different. 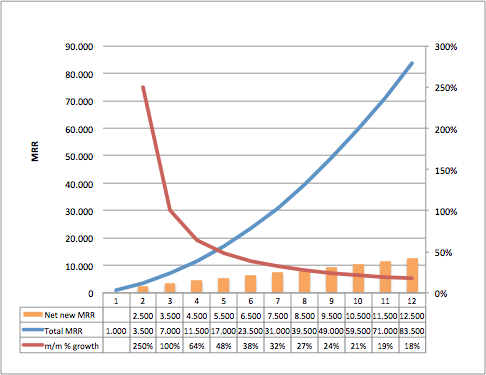 In contrast to plan #1, plan #2 doesn’t assume a constant m/m percentage growth rate. 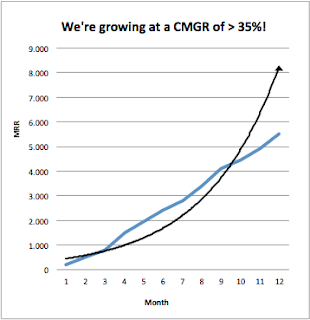 It assumes that the amount of net new MRR that you’re adding per month is growing, but on a linear basis. That may make the chart look less exciting, but I believe plan #2 is much more useful. If you use plan #2 and you’re on track after 6 months, it’s much more likely that you will still be on track after month 12. In the first 12-24 months or so after launch, plan to get to your target number by assuming a curve similar to the one shown in plan #2.